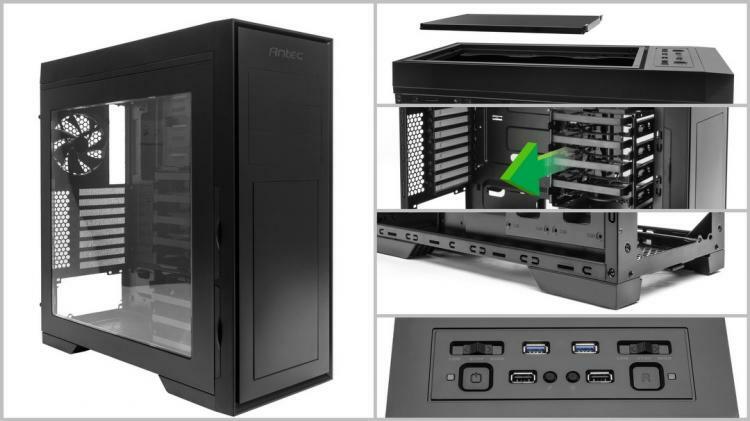 Rotterdam, the Netherlands - April 2016 - Antec, Inc., California-based manufacturer of high-performance computer cases, power supplies and mobile accessories, announced today the availability of the P9 Window, the latest addition to Antec's award-winning Performance series. The P9 Window is a fusion of stylish design and a sophisticated cooling system. Like all models in the series, the P9 Window is specially equipped to dampen system noise to the point where the computer is almost inaudible even when the fans spin at a higher speed. The P9 Window excels in combining a sleek, modern design with noise dampening features for silent computing and provides maximum performance and functionality for gamers when pushing the system to the limits. It is perfect for users of silent computing looking for the bare essentials. However, this chassis is also easily capable of supporting high-end hardware for gaming systems. As part of the Performance Series, the P9 Window brings the same level of performance as its predecessors at an affordable price while offering a wide variety of high-end features. The extensive cooling capabilities of the P9 exceed other chassis currently available on the market at this price range. Included inside is a three-part removable top fan cover, stopping noise from leaking out. Internally, modular HDD cages can be repositioned or removed to create more space along with built-in water reservoir and pump mounts, fully capable of supporting any system configurations. This allows you to freely choose your hardware without limits, period. Take full control of your system with the P9 from the Performance Series. The Antec P9 Window is available from May 2016, priced at £69.99 inc. VAT in the UK.